The Asakusa Umaimono-kai? What is it? The Asakusa Umaimono-kai What is it? Taking pride in their traditional cuisine and methods of preparing the nostalgic tastes of Asakusa, dozens of the finest restaurants and shops in the area got together and established the Asakusa Umaimono-kai in the early 1950s. Since then, Asakusa Umaimono-kai has served millions of visitors who come to Asakusa for the very best of local cuisine. Each of the participating restaurants strives for the perfect combination of the old and new while honoring the local traditions of Asakusa. 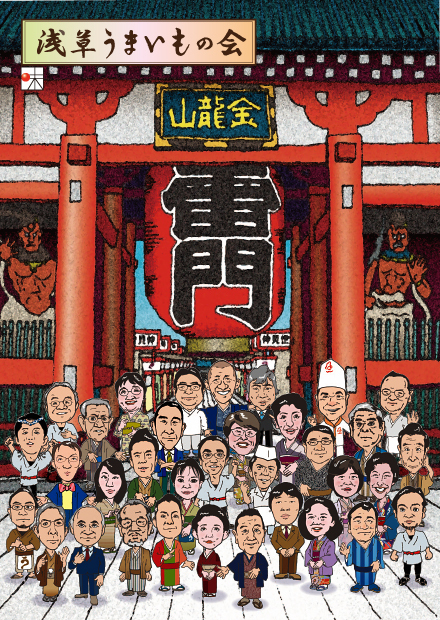 Together, through the Asakusa Umaimono-kai, they also promote the development of Asakusa, carry out public relations for each restaurant, and exchange information among members. People who are born and raised in Asakusa and love the town are known for having discriminating tastes in food and being generous and kind. The members of the Asakusa Umaimono-kai work together every day to preserve tradition while keeping up with the new.